Shagzo, or the art of wood turning, is an ancient art passed down generation to generation of Bhutanese. It is just as famous and important as Thagzo (the art of weaving) in the Bhutan culture. The master artisans are called Shagzopa. Bhutanese shagzopa make a variety of exquisite functional and decorative products like turned wooden bowls (dapa), cups (dza phob), plates, and containers of various unique shapes, sizes and colours. These products are made from a wide range of woods in Bhutan, such as tashing (Juglans regia), hashing (Taxus baccata), baashing (Picea spinulosa), sermaling shing (Acer camphellii) and etometo (Rhododendron arboretum). With their expertise, Shagzopa can produce highly valuable utilitarian wooden articles from special wood burls and roots of trees. These wooden articles can come in different shapes, sizes and colours under the skillful hands of shagzopa, reflecting the culture of Bhutan in each item. They are used in the daily life of Bhutanese, and are also favourable souvenirs of tourists. Specially turned wooden articles are saved as family heirlooms. The prices of these products are measured in terms of the quality of wood used, the quality of lacquer finish, uniqueness, size and colour. Dza (or bou) is how Bhutanese name the abnormal outgrowths or special wooden knots used to make the wooden articles. The best and the most valuable dza, in the culture of Bhutan, is dza ling choem, it is believed to emit rays of light during the night, and special light rays (tak tshen gi yoed) in the daylight. Various sizes of dza phob and wooden plates are made according to the quality of stripes of the dza. In the Bhutan culture, Dza phob is said to have the power to purify poison in curry and drinks by making the poison boil and flow out. Other traditional cups like boephor, ga phor and japhob are also made from wood. Apart from being a beautiful souvenir, which shows the arts in the cultural heritage of Bhutan, dapa or the traditional wooden bowls are also for serving food. The two halves of the bowl fit tightly together as cookie or salad bowls. 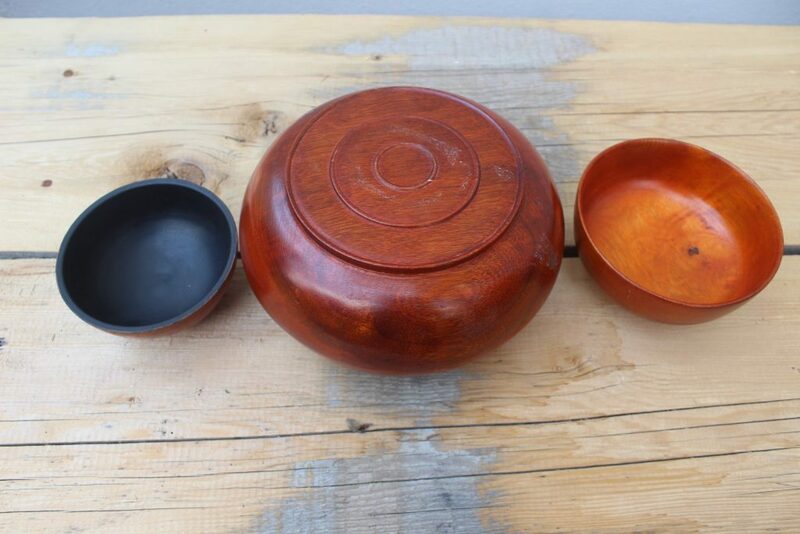 This round wooden bowl with a lid such as Bou dapa and Dum chem dapa are traditionally for serving rice. Monastic communities use bou dapa and dignitaries. Tsam deg, a serving bowl with a lid, was originally used in the northeastern part of Bhutan to contain roasted wheat and barley flour. Bhutanese store fruits during special occasions in Tho ke, a traditional wooden bowl, while Samden is for serving snacks. To make the wooden articles, starting from February or March, roughly curved pieces of the wood are soaked in cold water for three months to rid the smell and to strengthen. The crude shaped wood pieces are then dried over fire and left in the sun for about a month. These pieces will then be boiled in water to straighten them, then left until completely dry in the shade. After that, the crude pieces of hardwood are spun on the manual pedal lathe or the electrically operated motor lathe to craft. Using electronic motors, a Shagzopa can power the tools to craft three times faster than with pedal lathes. The coarse leaves of sogsogm (Tsuga dumosa) shrub are used to make the cup smooth , instead of sandpaper. For the final touch, Shagzopa use an indigenous substance known as ‘sey’ to lacquer black or red. Sey is applied only in the sun; and protected from the wind, since it dries out in the wind. Sey, extracted from the se-shing (Rhus succedanea), is the soul of the turned wood articles. Bhutanese lacquering is applied by the thumb. High-quality articles will have at least seven coats of lacquering, while a medium-quality finish has four layers. Three coats of lacquering are for articles that are not particularly of good quality, which will soon wane away. There are four types of sey viz; zhosey, tsisey, tsag sey and dzasey. Zhosey is known to be the best varnish. Tsisey is obtained from the seeds of seyshing while tsag sey is obtained from the bark of seshing. As the cultural heritage of Bhutan is rooted in the wisdoms of the Buddha, drums and drum sticks are a part of the rituals performed everywhere. The Bhutanese traditional drum known as nga, and the ngayog (drumstick) are indispensable articles in every temple, monastery and home. An ancient instrument of musical offering, the beatings of the nga symbolizes the subjugation of evil, indicates the fluctuation of tunes and wordings, and regulates the pace of other instruments during rituals and propitiation ceremonies. 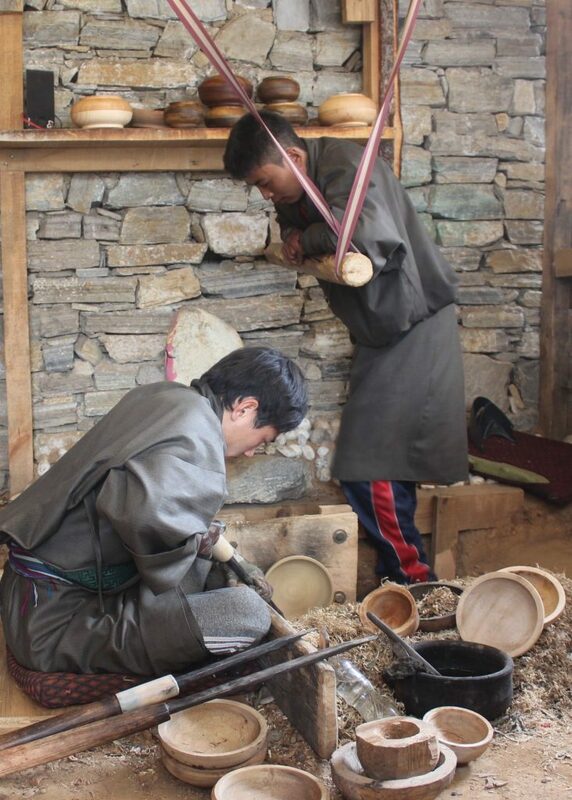 Traditional Bhutanese drum making requires a number of artisans skilled in woodturning, woodcarving, leather and painting. Drum making involves the curving of the wood into a cylindrical shape, carving of the wooden rims, fixing the handles, and finally painting and attaching skins.